Help needed with graphic design! We need help redesigning the graph below to be more visually interesting while retaining the information it currently holds. We would like it to be as graphically engaging as this graph, and if possible have it incorporate our logo. How can 17.7 million tons of carbon from fossil fuels be avoided through wood stoves? 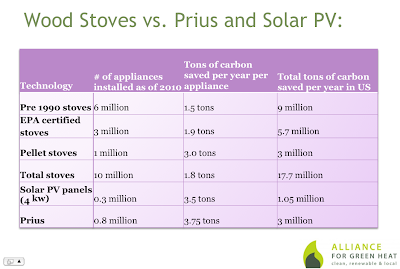 The 17.7 million tons of carbon is a rough estimate based on 10 million wood stoves in operation today in the US. We use the estimate of an average of 1.9 cords of wood being used in each wood stove, based on national studies. For the estimated 3 million EPA certified stoves, we calculated that 1.9 cords of wood would reduce carbon from fossil fuel heating sources by an average of 1.9 tons per year. 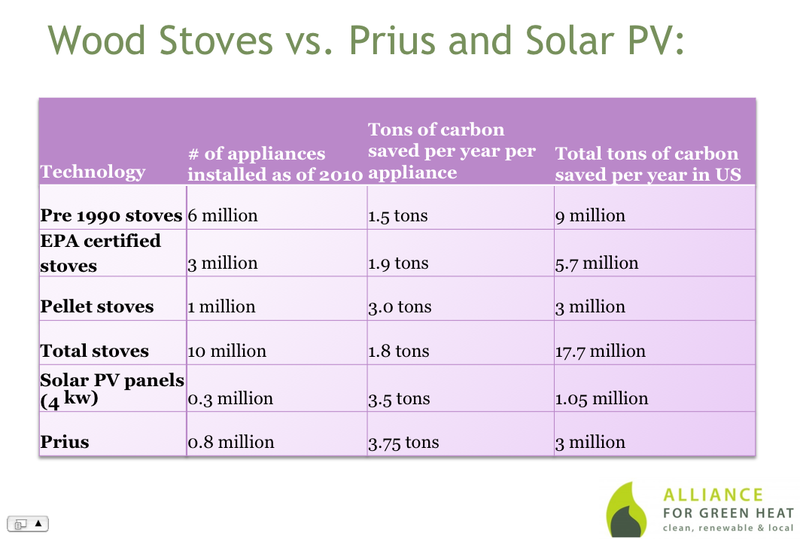 For the six million older, uncertified stoves, we calculated that those stoves would only reduce carbon from fossil fuel heat sources by an average of 1.5 tons based on the lower efficiency of those stoves. For pellet stoves, we used 3 tons of pellets as the average amount for the 1 million pellet stoves in operation today. We calculated that they reduced 3 tons of fossil fuel carbon. We did not attempt to calculate how much fossil fuel usage indoor and outdoor wood and pellet boilers avoid, but it is safe to say the annual total would likely be over 20 million tons. We also did not subtract any carbon released by stoves because we believe that cordwood for residential heat is an extremely low carbon fuel. Cordwood is typically gathered or harvested from trees that are already dead and/or down, or from incredibly local, small-scale harvest. A small percentage of cordwood is from larger scale, commercial harvesting which is likely to have a slightly higher carbon footprint. Those larger commercial operations are likely to be geared to the kiln-dried, small bundle market that is more for fireplaces, and not for wood stoves. The table below shows our calculations and a comparison with residential solar panels. To understand carbon impacts of residential heat, it helps to get get personal. Three Alliance for Green Heat (AGH) board members and one AGH supporter - Jon Stimling, John Ackerly, Josh Elmore and Peter Caldwell - calculated the carbon footprint of their homes in order to better understand home heating carbon impacts. 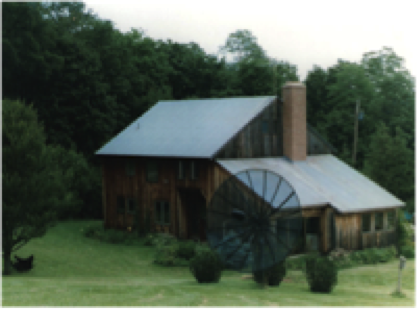 Each household employs at least one form of renewable energy. The four individuals emitted between .92 and 3.8 metric tons of carbon per year to heat their homes, which is well below the national average and even further below their respective state averages. The lower-than-average emissions are due in part to the fact that each household uses wood or pellet stoves to provide some portion of their heating needs. The calculations were reached using the carbon calculator website; www.carbonfootprint.com, a well regarded program that assigns .18 metric tons of carbon for a ton of wood pellets or a cord of wood. The average American home produces about 12 tons of carbon a year, according to most authorities and 40 to 60% of that on average is used for heating. The EPA estimates approximately 4 metric tons of carbon dioxide (CO2) per person per year (about 17% of total U.S. emissions) are emitted from people's homes. The individuals featured here all have household footprints of 3 to 7 metric tons, but if calculated using the EPA per capita average, these homes would emit 8 to 20 tons metric tons. The home with the lowest carbon impact from heat has a pellet furnace that can meet 100% of the home’s heating needs. 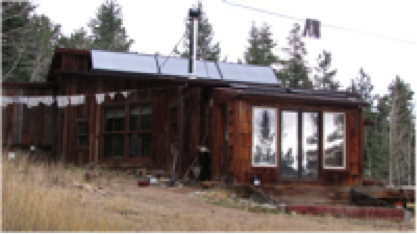 One Board member has solar panels, which covers 100% of his electric load and another buys 100% wind power. Some variance in CO2 output can be attributed to how electricity is generated in each household’s particular state. A 1,900 square foot home occupied by four people in Maryland has a total average output of 6.95 metric tons of CO2 a year. After purchasing 100% wind power, the footprint drops to 2.85. Natural gas, used as a backup heating fuel, is the largest contributor, totaling 2.49 metric tons of CO2 a year. The combustion of 2 cords of wood in an EPA certified LOPI Patriot circa 1995 accounts for the other .37 metric tons. The wood is obtained from the urban wood waste stream through local tree services working in the neighborhood. A 1,800 square foot home occupied by five people in Colorado. 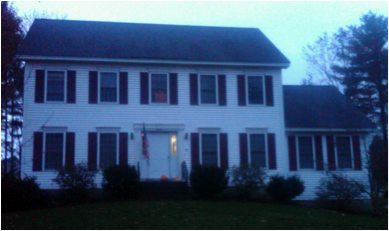 This household emits 3.08 metric tons of CO2 a year on average. The largest contributor to this impact is due to the reliance on propane as a back up heating fuel. It is 2.90 metric tons of the total emissions. The remaining .18 metric tons of CO2 is attributed to the single cord of wood burned per year in an EPA certified 2002 Jotul. The wood is either self harvested or purchased from people hired to thin local forest for fire suppression. 100 percent of electricity is from solar panels installed near the house. 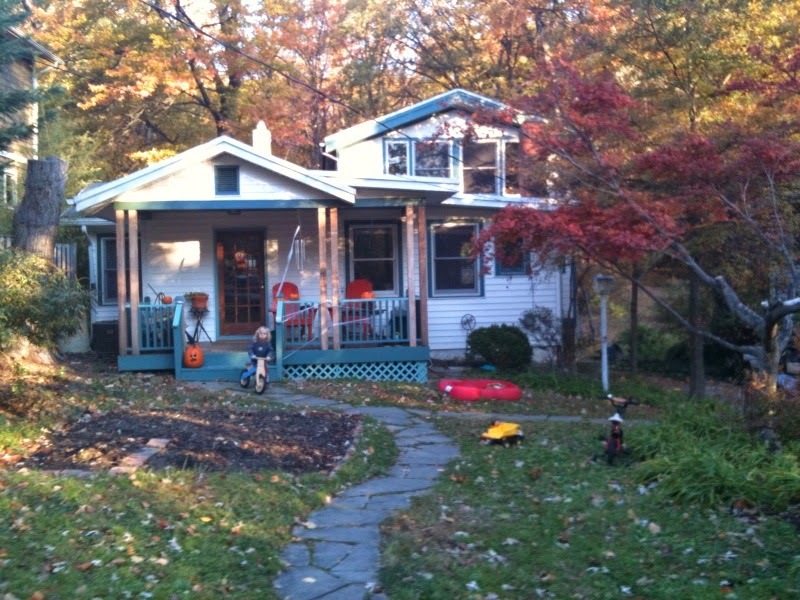 A 2,650 square foot home in upstate New York occupied by two people. The household’s total CO2 footprint is 7.59 metric tons a year. This result is a combination of the home’s electricity consumption (9,733 kwh/yr), which contributes 3.79 metric tons of CO2 to the total, and heating oil (back-up fuel) which is responsible for 2.52 metric tons of CO2 a year. Finally, the combustion of 7 cords of wood a year in a Vermont Castings stove results in 1.29 metric tons of CO2 being released. The wood is self harvested and split by hand. 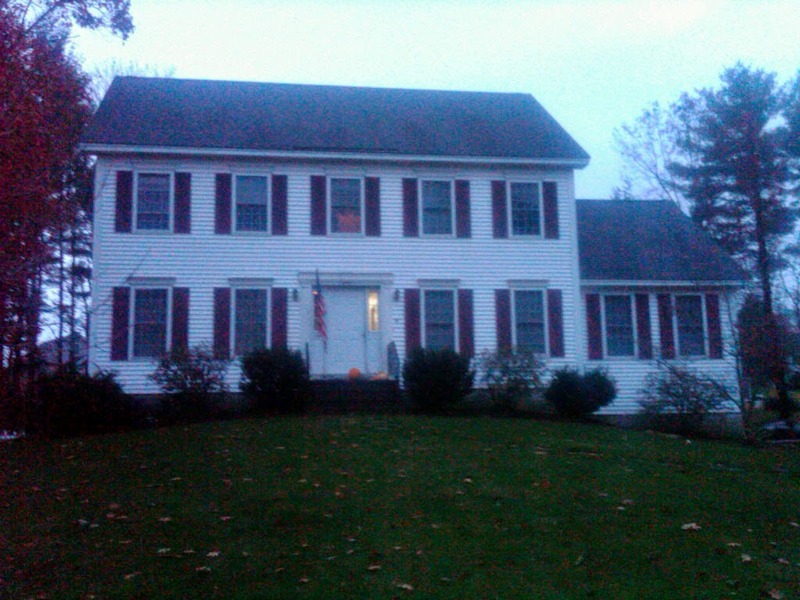 A four person 2,500 square foot household in New Hampshire emits 7.02 metric tons of CO2 a year. The largest contributor to this total was electricity consumption (15,000 kwh/yr on average), which resulted in 4.65 metric tons of CO2 being released. Propane for cooking and hot water contributed 1.45 metric tons to the total. With the remaining .92 metric tons released through the combustion of 5 tons of wood pellets in a Harman PF100 furnace each year. These four households demonstrate the wide array of energy saving measures and methods to offset CO2. There is no blanket, cure-all strategy to reduce fossil fuel consumption, however this group shows how relatively small measures like running a wood stove can help to decrease heavy CO2 emissions. Everyone in the thermal biomass or energy efficiency sector should consider doing their household carbon footprint as well as getting a home energy audit to get a more tangible understanding of these issues. Understanding your carbon footprint in comparison with other Americans is also useful. Finally, understanding the potential of strategies to offset CO2 from fossil fuels, like using a modern wood or pellet stove in your home, is the building block for appreciating how we as a society can intelligently leverage this technology. Volumes of opinion and analysis have been written on the results of the midterm election and what they mean for renewable energy policies going forward. Once mainstream policies for mitigating carbon emissions, like cap and trade, will likely be considered dead on arrival when the 112th congress convenes. However, the Farm Bill among other pieces of legislation could still move us toward comprehensive renewable energy and efficiency policy and could shift biomass solutions to the forefront. One immediate impact of the election is that many of the most important committees will have new chairs (i.e. Senate Agricultural Committee) and some Congressional supporters of biomass will not be returning. AFGH has selected a number of outcomes and developments from the midterms that may have an impact on thermal biomass policies. Mainstream consensus tells us that the upcoming lame duck session and 112th Congress will be defined by gridlock. This could especially be the case with environmental and energy policy. The upcoming House majority leader John Boehner has gone on record supporting intensive review and possible halting of EPA efforts to regulate green house gases. A very different Congress will be reconvening in January. The Blue Dog Coalition, a group more likely to be opposed to comprehensive energy/environmental reform, experienced the biggest losses in the Democratic caucus. They saw their numbers reduced from 54 members to 26. Conversely, the Progressive Caucus now makes up a plurality in the Democratic House caucus, with 95% of their members returning. This ideological shift to the left within a wing of the Democratic Party could help thermal biomass. The outcome of a number of specific races is worth noting. The election of Representative-Elect Charlie Bass (R-NH) who has indicated support for biomass in the past, puts another ally of biomass in that district’s seat. Additionally, Rep. Jay Inslee (D-WA) won reelection, as did Rep. Peter Welch (D-VT), Don Young (R-AK), Betty McCollum (D-MN), Michael Michaud (D- ME) and many others. The Senate was an impediment to energy/environmental reform well before the election and Tuesday’s results would seem to only reinforce this. However, the likely shift in Republican Party behavior, from heel draggers to policy makers, means biomass could well be picked up as an issue with bi-partisan support if a compromise bill is drafted. Former Rep. Hodes (D-NH) loss to Senator-Elect Kelly Ayotte is a big loss for the biomass movement. Rep. Hodes, who gave up his seat in the House to run for the Senate, was a supporter of thermal biomass and other strategies to stimulate rural jobs and slow climate change. On the campaign trail he reiterated this support for biomass. His opponent, Ayotte, has not yet signaled support for the thermal biomass industry. As Congress prepares to re-authorize some $200 billion dollars in farm programs, Senate Agriculture Committee Chair Blanch Lincoln (D-AR) lost her reelection bid. This opens up the top position on the Senate Agricultural Committee. A top candidate for this position is Senator Debbie Stabenow (D-MI), a proponent of renewable energy funding, including biomass. Additionally, Stabenow is considered to be less friendly to the ethanol corn lobby then former Ag Chair Lincoln. Tying biomass policy to the agricultural bill should be an essential goal of advocates hoping to see substantial government support materialize. Champions of thermal biomass who won re-election include both Maine Senators, Susan Collins (R-ME) and Olympia Snowe (R-ME), Mike Crapo (R-ID), Jeff Bingaman (D-NM), Maria Cantwell (D-WA), Patrick Leahy (D-VT), Bernie Sanders (I-VT), Don Wyden (D-OR) and many others. Senator Murkowski, also very supportive of thermal biomass, has not yet been formally declared the winner in Alaska. One of the biggest developments of Tuesday’s election occurred at the state level in California with the rejection by voters of Proposition 23. This proposition, heavily funded by out-of-state oil industries and other wealthy interests, would have suspended implementation of California’s landmark climate change bill. It was considered by many environmentalists to be the most important initiative during the midterms and the rejection of Prop. 23 is a victory for the environmental movement and alternative energy advocates. California continues to be a leader in climate change mitigation and the failure of Proposition 23 will hopefully lead to other states following the Golden Gate State’s lead. The Food and Agricultural Organization of the United Nations released a report this year in Rome titled What Woodfuels Can Do to Mitigate Climate Change. The report is a comprehensive study of the state and potential of the global woodfuel market and the numerous benefits it's sustainable growth would entail. The report analyzes the resources and markets available on a regional basis, arguing that a huge potential for growth exists. Future woodfuel use energy trends, potential climate change mitigation and numerous positive socio-economic and environmental impacts, especially in developing countries are also examined. The report found that biomass energy currently accounts for nearly 10% of primary global energy consumed annually, more than all other renewable and nuclear energies combined. Biomass consumers in developing countries stand to benefit from modernization programs which would reduce health effects and improve fuel efficiency. Meanwhile many in the developed world are looking to sustainably manage domestic forest resources while developing first class wood stove industries. AFGH is pleased that the FAO report provides such a balanced view of use of biomass in both developed and developing countries. The National Taxpayers Union and US PIRG-Education Fund, a conservative and liberal organization, teamed up to produce a list of Federal programs that can be cut at no adverse effect to the American public in a report entitled, “Toward Common Ground: Bridging the Political Divide to Reduce Spending.” While most of the recommendations concern wasteful military programs, there are two programs listed that relate to biomass. The first program is the refundable tax credits for ethanol. The tax credits targeted go to oil companies that blend ethanol with gasoline, instead of the ethanol producers themselves. The reasoning the report gives is that the oil companies already makes significant profits and the ethanol industry should be mature enough at this point to not be subsidized by taxpayers. Additionally both industries have very healthy profit margins with the subsidy and could likely make a profit with no subsidies. The second program is to reduce funding for public timber sales that sell at a loss. They claim that, “The Forest Service has spent more on federal timber sales in recent years than it has collected from the companies that harvest the timber.” The report does not address whether the Forest Service has other goals, such as thinning or other forest health reasons. Overall the authors say the recommendations in the paper could result in $600 billion in savings by 2015, if implemented. Explanation: Large oil companies that blend gasoline with corn-based ethanol, rather than the ethanol producers themselves, receive billions of dollars in subsidies each year. The credits combined with the Renewable Fuels Standard set up a taxpayer subsidized mandate, which is bad fiscal policy. Savings: By 2015, cutting this program will have saved $ 22,650 million. Explanation: The Forest Service has spent more on federal timber sales in recent years than it has collected from the companies that harvest the timber. This is an unwise use of taxpayer dollars. Savings: By 2015, cutting this program will have saved $ 279 million.